What Does It Say That Half the GOP Base Would Support Trump’s Authoritarianism? Two professors found in a poll that slightly more than half of Republican voters would support postponing the next presidential election if Donald Trump demanded it. What does this result tell us? Not much, argue a slightly cranky David Graham, and a very cranky Josh Barro. It’s merely “a poll explicitly designed to produce an alarming result,” as Barro says. The question in the poll may be a hypothetical, but the hypothetical is illuminating. Indeed, the point is to measure how far the Republican base would follow Trump — whether a move as nakedly undemocratic as postponing an election would be seen immediately as dangerous and un-American. It is the polling form of the question, “If Donald Trump jumped off a bridge, would you jump too?” It is useful to learn that many would. Many Republicans believe Trump when he claims to have legitimately won the national vote. 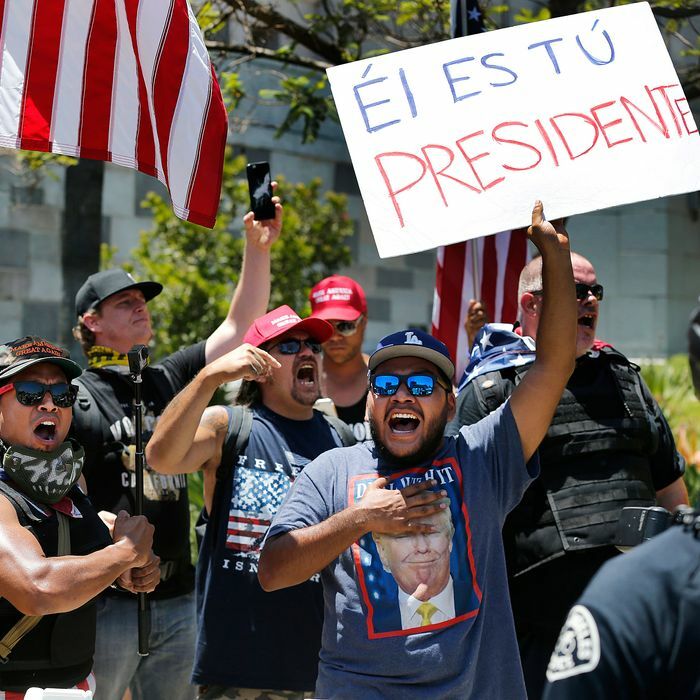 The hypothetical remedy proposed by the pollsters, delaying the election until noncitizens can be removed from the voting rolls, follows logically from the fantastical beliefs the president has promulgated. To be sure, skeptics might question whether Republican voters actually believe Trump’s conspiracy theories. Polls, usually liberal ones, have tested the more outlandish and bizarre convictions among the right-wing base — is Obama Muslim, is Obama an American citizen, and so on. For years, mainstream journalists have often treated these polls skeptically. Graham, in 2012, argued that many Republicans were merely affirming anti-Obama sentiment out of partisan solidarity, as opposed to actual conviction. But the rise of Trump ought to have shown how serious these “crazy” views are. In 2015, many of us dismissed polls showing Trump leading for this very same reason. It wasn’t a serious indication of intent, we thought, just a symbolic act of sending a message. But then they voted for Trump. And many of them continued to support him despite a procession of bizarre and facially absurd statements. Those shocking polls of the craziest beliefs of the Republican base turned out to be the most reliable data about what the future held. Barro rightly notes that the hypothetical of Trump postponing the election fails to accurately depict the environment in which such a move would occur. “In the real world, if Trump proposed to postpone the election, he’d do so in an environment where he’d get pushback not just from the media but from other Republican officials,” he writes. One would certainly hope. The experience of the Trump administration shows that some Republican officials are sometimes willing to stand up to his most blatant violations of political norms — nobody has forced the release of his tax returns or blocked his self-enrichment, but they have made clear their opposition to firing Robert Mueller. The Trump administration has also revealed a large state-media apparatus that is willing to follow every turn of the party line, however transparently dishonest. A hypothetical world in which Trump demands a delay in the election is one in which Sean Hannity, Rush Limbaugh, and CNN’s cohort of pro-Trump mouth breathers would be cheering him on. The party would be split, and many Republican senators would loudly denounce the administration. The poll indicates that just over half of Republicans would support Trump, and that figure sounds about right. Half the Republican base following Trump would mean a political atmosphere in which about two-thirds of the country opposed him, and the president was isolated. It would mean Trump would probably lose. Trump’s authoritarianism is merely the most extreme manifestation of the Republican Party’s growing authoritarianism. The good news is that the transformation is not complete, and that enough remains of the old mainstream party to shackle the president’s most dangerous impulses. But the fact that he is being curtailed should not blind us to evidence of how far the party has already gone.